'Borrowing from them was like a favour Mallya did to them,' says Shekhar Gupta. 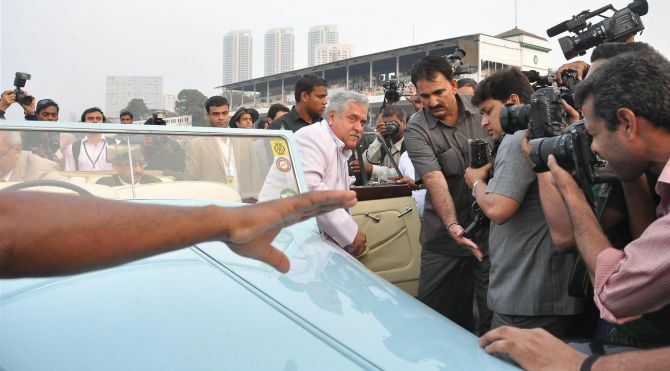 IMAGE: The King of Good Times alights from his Rolls Royce at the Mahalaxmi racecourse in Mumbai, 2013. On February 7, 2010, at the peak of the modern makeover of State Bank of India, its aggressive chairman O P Bhatt (2006-2011) was doing a show-and-tell at the launch of his new technology platform. Unlike most PSU captains, Mr Bhatt loved ambition and scale. He was going to make his tech launch into the year's biggest corporate party. He hired Mumbai's Brabourne Stadium, invited every big name in business and they all turned up, including then finance minister Pranab Mukherjee. Mr Bhatt had personally called each of his guests (this writer included). He started the presentation with lasers. All lights in the stadium were turned off as his guests watched, spread over scores of round tables, and applauded. Then a distracting buzz came from the left. In the reflected laser glow you could see about a dozen very important looking silhouettes. It was Vijay Mallya making a typically grand entry -- as he would into a home, a party, anywhere, with his flunkeys, factotums, retainers, bodyguards, one of them even carrying his two mobile phones on a silver tray. His boys were all muscular, tall, in dark suits (mostly the VVIP security safari types if I remember correctly) and glowed in his power. Their collective aura was enough to force Mr Bhatt to halt his presentation and ask for the lights to be switched on. And, as everybody realised who it was that stopped the show, there were whispers. Mostly of envy and admiration. "Boss, whatever you may say, you should be a borrower like VJM," said a business leader on my table. "He has the power to disrupt his biggest lender's party and yet be treated with izzat." Such was Mr Mallya's power. Remember, in 2010 he was already steeped in losses and debt. Remember also that 2010 was still the era of post-2008 stimulus packages when rates were low and liquidity plentiful. It was also when oil prices were rising, but nothing would contain his ambition. I do not believe any of his lender PSU banks would have had the cheek to caution him. They were thrilled to be invited to his parties, and honoured when he came to theirs. Mr Mallya achieved something no Indian businessman had so far: He became, even as a repeat borrower, the banker's most valued trophy. Even when he had prospective defaulter written all over his balance sheets. This isn't an insight into the life and times of 'Dr' (honoris causa) Vijay Mallya. I do not have the skills to unravel his business dealings, mergers and de-mergers. Nor, I suspect, did our fawning banks, which is less defensible. His creativity was never to be doubted. At the peak of the go-go years in 2007-2008, for example, when he bought over the dud Air Deccan at an enterprise value of Rs 2,100 crore (Rs 21 billion), it was Deccan that 'merged' Kingfisher into it. Everybody knew why. He was bypassing the civil aviation ministry's truly idiotic rule (which persists) that to fly abroad an airline should have been in operation for five years. Kingfisher had only started in 2005 and Mallya was in a hurry. So he bought Deccan but merged his airline in it, to claim overseas flying rights. Very creative, you'd say, and applaud both his cheek, and sense of humour in showing up the bureaucracy for its regulatory incompetence. But would you lend him money for this? Put yourself, however, in the shoes of the bankers, particularly the public sector ones. Mr Mallya wasn't just an entrepreneur, but a prominent member of Parliament on first name terms with most of the Cabinet members through Atal Bihari Vajpayee's NDA and Manmohan Singh's UPA. As a second-term MP, he was a member of the key consultative committees including, no surprises, civil aviation and fertilisers (Mallya's UB Group also owned Mangalore Chemicals & Fertilisers). If Indian Parliament is so unmindful of conflict of interest, why blame poor bankers for being starry eyed? They vied to be invited to his parties and events, including IPL matches, where he rubbed shoulders with the sexiest, the most powerful and famous in the country, from film stars and models to politicians and civil servants and indeed, top journalists and media barons. Lending to Mr Mallya was the bankers' season ticket to corridors of power and glamour. Borrowing from them was like a favour Mallya did to them. This, when every diagnostic told you Indian aviation was nose-diving. In fairness, we also must note that this was exactly the period of competitive, hyper-endocrinological blundering in corporate India. Jet Airways too, in the kamikaze fight for market share, acquired Sahara, a dud of Deccan dimensions, also for Rs 2,000 crore (Rs 20 billion) on borrowed money. This competitive stupidity nearly killed Indian aviation. Kingfisher choked on its acquisition. Jet had a near-death experience. But its promoter had one attribute in such contrast with Mr Mallya: Endless, if exaggerated humility, and ability to say, 'I screwed up.' Without these, you should never take other people's money, as debt or equity. The Mallya story is more about our easy embrace of cronyism. Parliament, politics, the bureaucracy, the media, the banks were all complicit not just in the rise and fall of Vijay Mallya but of many others. In the name of socialist protectionism we have built a giant, permanent nexus of the powerful where contacts and networks matter more than balance sheets. Most of our traditional businessmen, therefore, have pockets deep enough for our puny 'sarkar' to fit in quite smugly. Some of that is changing now, and whether Mr Mallya likes it or not, the media is contributing to this virtuous change. By the way, among the businesses he acquired and bankrupted was also a news media company. For more details please ask my friend, M J Akbar. Like the Khans of Bollywood, our stressed borrowers are also evergreen, and like their fans, the bankers equally starry-eyed. That series was causing the National Democratic Alliance government discomfiture. A few messages came from 'higher-ups' complaining we were overdoing it. Then, one afternoon, the big man called himself. "Arrey, kitney din chalayenge is series ko aap, poora varsh? (For how long will you run this series, a whole year)," he asked. I said, "No, Atalji. Minimum qualification to make it to the list is that you should be defaulting on more than Rs 500 crore (Rs 5 billion), so may be a few more." "Then why have you put Baaluji there? His default is just Rs 35 crore (Rs 350 million)," he asked?" "Because he is an MP and a minister, Atalji. So he qualifies with much less. Because the bar for MPs must be much lower in such cases," I talked my way out of admonition. The DMK's T R Baalu was the environment and forests minister in the NDA cabinet and owned a sick business defaulting on Rs 35 crore of loans. We now have a Rt Hon MP with a Rs 9,000-crore (Rs 90 billion) default on 17 public banks and when he talks down to us all from London on Twitter, we listen. We've come a long way indeed.